Dr. Lagally practices evidence-based medicine with a focus on improving overall health and well-being to prevent and treat illness. Dr. Karl Lagally is a board-certified family medicine physician by the American Board of Family Medicine. 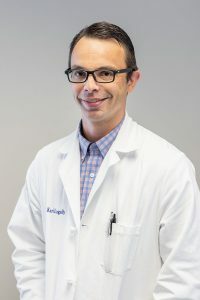 A graduate of Penn State University and Philadelphia College of Osteopathic Medicine, he completed his family medicine residency at Virtua Health System in New Jersey and has been at Prime Care since 2007. He is a member of The American Academy of Family Physicians and is experienced in treating patients of all ages. Dr. Lagally is currently accepting new patients ages 12 and up. To schedule an appointment, please call our office at 540-786-1200. © 2019 · PrimeCare. Site designed by Adam Sheets Design.